Extreme Weather Is Horse Feathers! I could have said something else, but lest you didn’t get the message, extreme weather events are not getting more numerous do to climate change, or any other change. Most people don’t like technical subjects like this, and that’s why they believe the politicians and news media that we, humans, are causing the weather to get worse. We can change local climates, but the hypothesis that weather is getting more extreme is easily falsifiable. 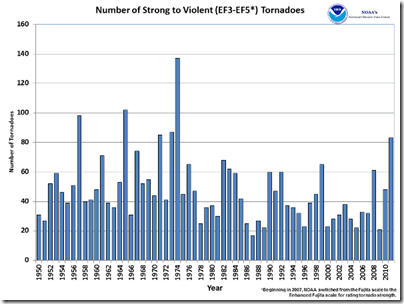 There is no discernible trend in the number of strong tornadoes in the continental US over the last half-century. 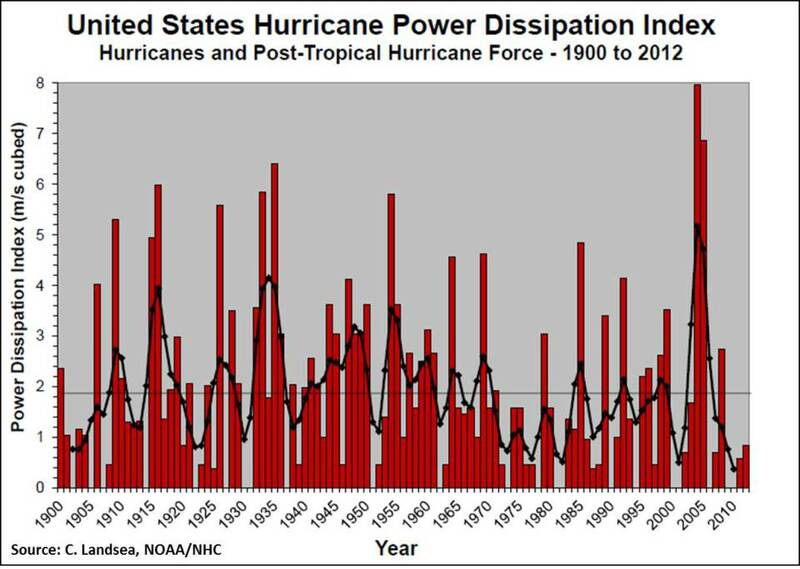 There is no discernible trend in the number of hurricanes in the last century. Yep. Katrina was a big one, but there have been very few hurricanes since. Here are a couple of graphs drawn with data from NOAA that demonstrate that there is no increase in either of these extreme weather events. There are no trends no matter what the media says, and there is no scientific consensus for that hypothesis. All I know is, that no matter what happens with our weather, God is in control. And I must admit I truly enjoying this lovely cool climate in April. Arkansas is miserable when the heat moves in. It’s as hot as Hades. To hear the media and other leftwingers, you sure wouldn’t believe this, would you. WE are at fault, and WE HAVE TO PAY now! Did you hear Obama’s latest electric car bankruptcy will be costing us about $200 million just because he’s a ‘true believer’, too?